Reference is invited to this office OM No.A-26011/20/MACPS/2017/MF.CGA(A)/NGE/39 dated 13th April, 2018 and its subsequent reminder of even no. 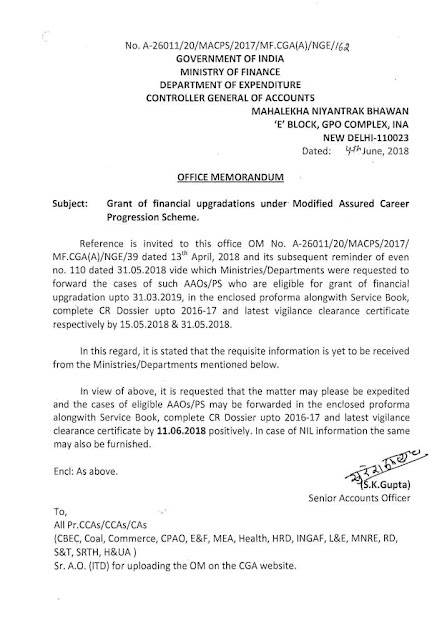 110 dated 31.05.2018 vide which Ministries/Departments were requested to forward the cases of such AAOs/PS who are eligible for grant of financial upgradation upto 31.03.2019, in the enclosed proforma along with Service Book, complete CR Dossier upto 2016-17 and latest vigilance clearance certificate respectively by 15.05.2018 & 31.05.2018. In view of above, it is requested that the matter may please be expedited and the cases of eligible AAOs/PS may be forwarded in the enclosed proforma alongwith Service Book, complete CR Dossier upto 2016-17 and latest vigilance clearance certificate by 11.06.2018 positively. In case of NIL information the same may also be furnished.